One element of cybersecurity that is often overlooked is the impact of the cyber world on people’s physical security. Parents seeking to protect their children are often aware of concerns such as cyberbullying and adolescents making inappropriate social media posts, but remain uninformed about the grave danger of easy access to illegal drugs facilitated by the protection afforded by the anonymous nature of the Internet. To purchase from cyber drug dealers, people use Tor. 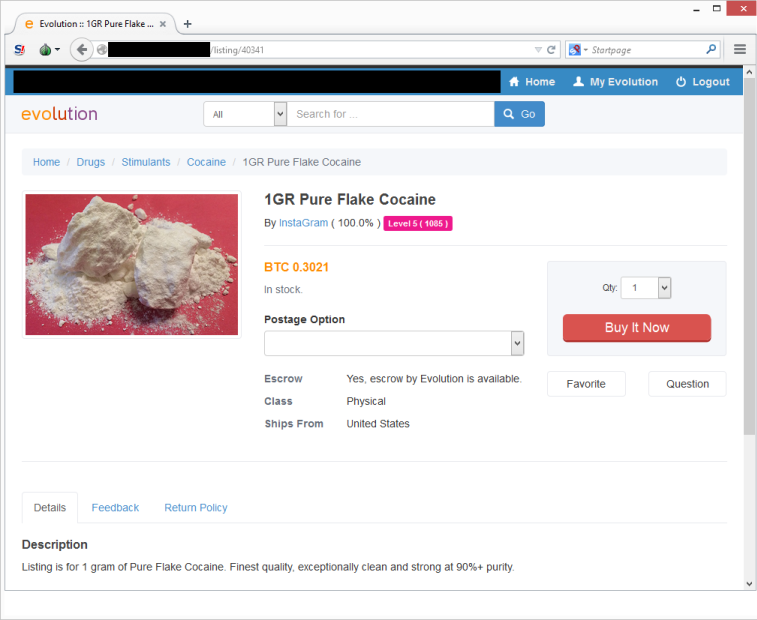 Cocaine offered for sale on the Evolution marketplace accessible via Tor (certain information redacted). You may not have heard of Tor, but if your kids want drugs, they certainly could have. Originally created by the United States government to protect intelligence agents, Tor is a system for anonymizing communications over the Internet. Fully protecting a user’s identity with Tor used to require some technical sophistication, but, in recent years, with the advent of the downloadable pre-configured Tor Browser Bundle, anonymity is available to pretty much everyone. By simply running Tor on a computer, smartphone, or tablet, a user has his or her web communications bounced through multiple hops on an anonymizing network; not only do the user and destination server not know each other’s identities or even where one another are located, but all but the last servers along the communications path don’t know either. Tor provides the anonymity that sellers of drugs need in order to remain in operation. Tor sites – which have pseudo-URLs that end in .onion – have their locations obfuscated by Tor in a manner similar to the way it hides Tor users. It is not surprising, therefore, that illegal marketplaces that are accessible only to users of the Tor network have flourished; Silk Road and Silk Road 2.0, both of which were ultimately located and shut down by law enforcement, are perhaps the best known. But, the disappearance of these “eBays of illegal commerce” did little to curtail illicit activity; new, even more nefarious marketplaces popped up and are fully operational. Finding a marketplace from which to purchase drugs is easy – a simple Google search will turn up multiple such digital souks. (Perhaps Google should eliminate such pages from search results, but that is a different issue.) Browsing a market shows many different types of offerings – from drugs to stolen credit card numbers – all available for immediate purchase. Naturally, payment is expected in Bitcoin – a global crypto-currency that people can easily obtain and transfer to others without revealing their true identities or locations. Vendors of illegal physical items that must be shipped – such as drugs or guns – even provide information to customers about how their goods will be delivered – along with information on how they prevent detection by law enforcement of the delivery. Contrast the convenience, simplicity, and relative safety of purchasing heroin or cocaine online using Tor technology with the risks of entering an unsafe neighborhood or building, or with the need to deal in person with unsavory characters, and it is obvious why such marketplaces flourish; people who want illegal drugs (and other prohibited items) can obtain them today in a fashion far easier than ever before. Tor offers people in repressive nations the anonymity that they need to safely communicate, provides whistleblowers with protection, and delivers to journalists the opportunity to write exposes that without Tor might not have been written. But it also poses a grave danger to many children. And, if you are a parent of a tween or teen you need to know about it.